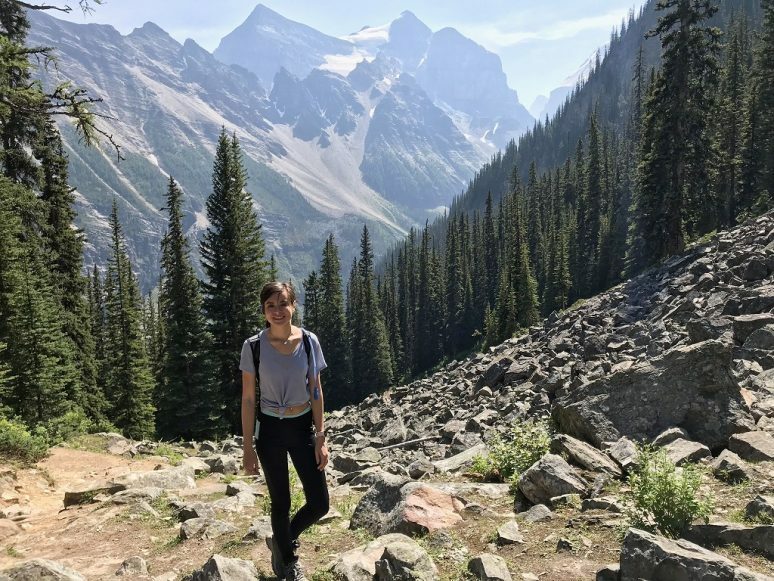 Banff National Park in Alberta, Canada is quickly becoming one of the trendiest places to visit, and it is easy to see why. 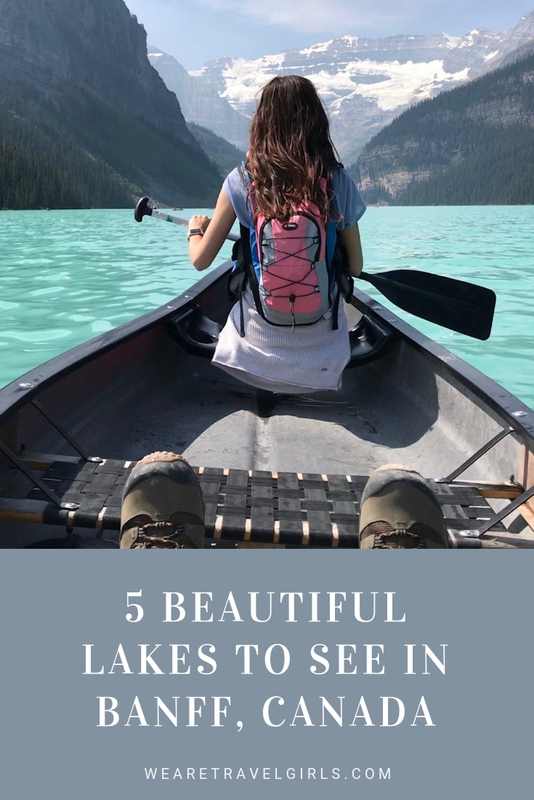 Countless photos have been popping up all across the internet of the gorgeous blue lakes located in the Rocky Mountains just an hour outside of Calgary. 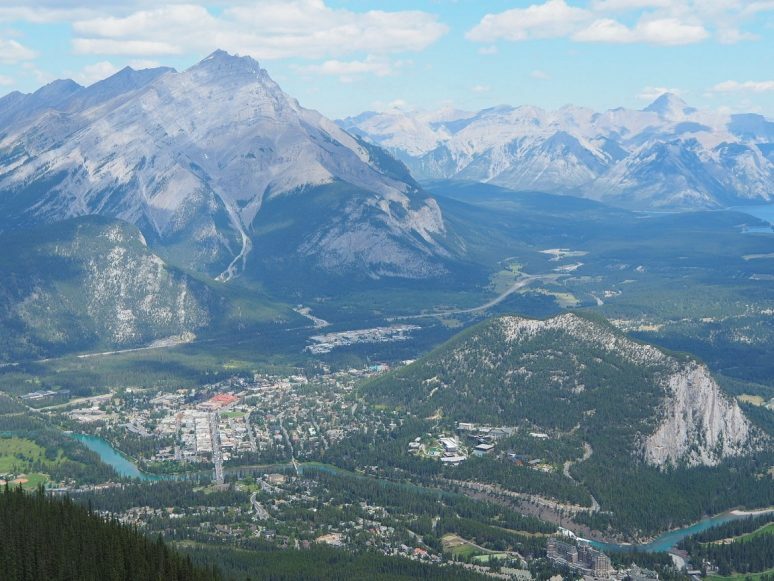 Banff National Park offers a fresh air getaway in the mountains, with a wide variety of activities anyone can enjoy. There are many beautiful lakes to take a photo of near Banff, and the list here are some of the most accessible. For all of these lakes, you will either be able to park and walk directly up, or you will find a clearly marked trail leading the way. 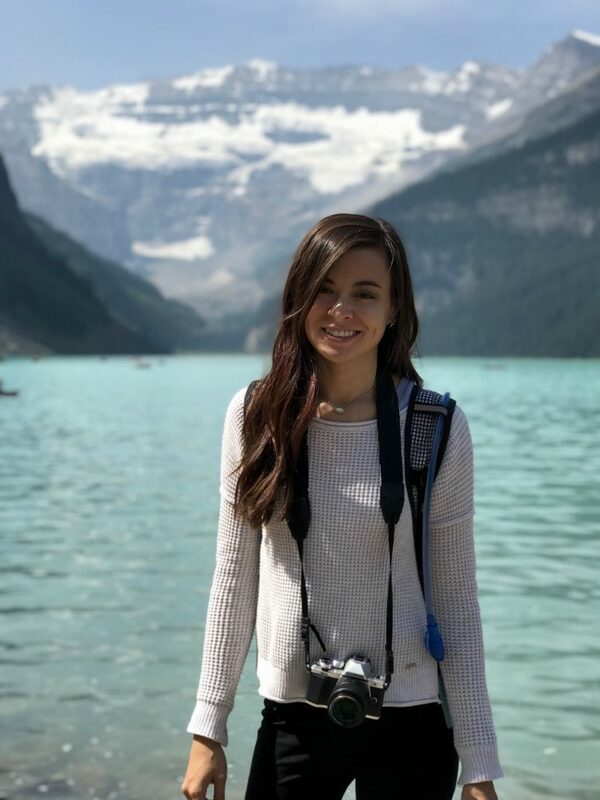 Keep in mind that if you are visiting Banff, it is highly recommended that you rent a car in order to get around and visit some of the lakes that are further away. You will also be required to purchase a parking pass when entering, so if you can get access to a parking pass ahead of time, you will save time getting into the park. 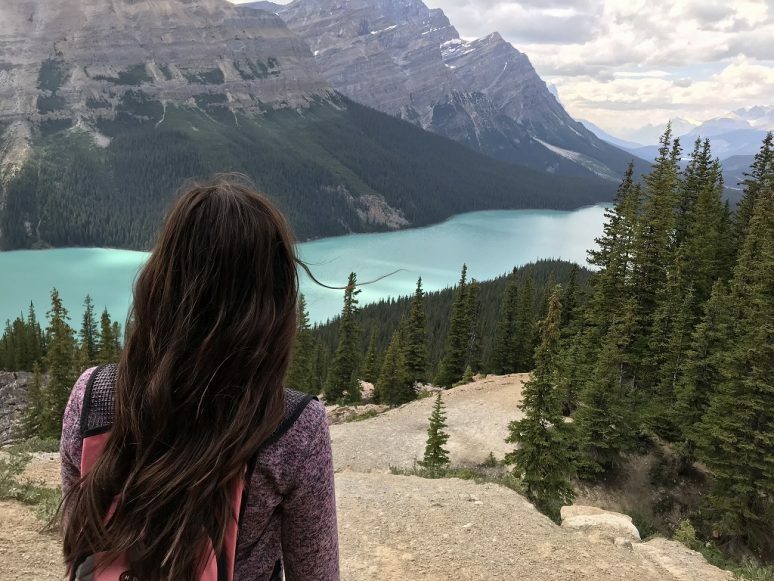 There also is not a lot of cell phone service in remote areas, so you will not want to depend on a rideshare app to get you from point A to B.
Peyto Lake is an hour northwest of Banff, making it a bit further away but definitely worth a visit. This turquoise beauty is less visited, making it a prime spot to take some photographs later in the day. There is an easy hiking trail that takes you to an overlook, and a few rockier paths give you a crowd-free view. 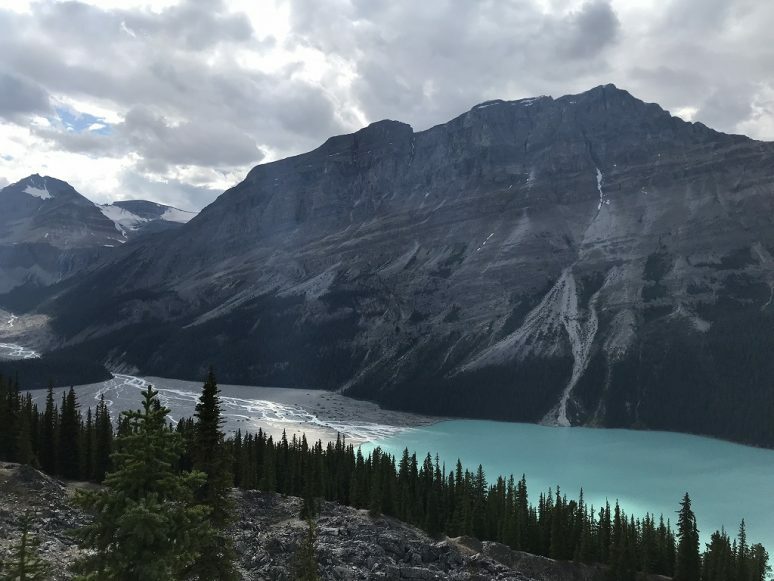 Drive to the Bow Summit parking lot located off Icefields Parkway, and complete the quick and easy Peyto Lake Overlook hike. My husband went at around 3 pm on a Tuesday and had no issues finding parking. 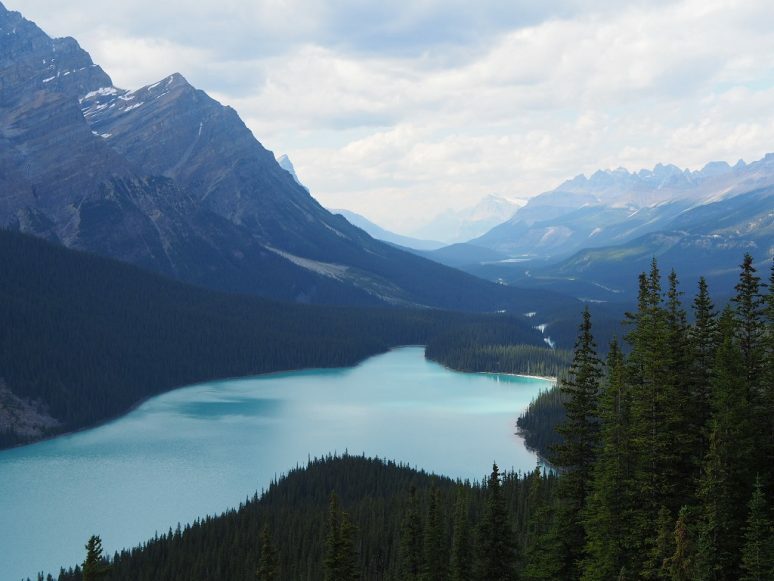 From here, you will find wooden platforms built to give you a gorgeous overview of Peyto Lake. There are a few other hikes that offer different vantage points of the lake as well. 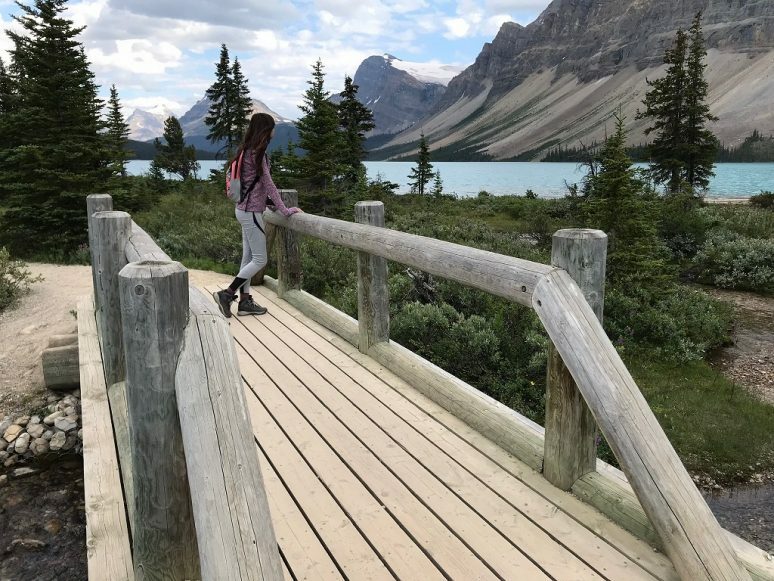 Also an hour outside of Banff, Bow Lake is easy to access from the main Icefields Parkway road, and you’ll definitely see it on your left as you drive to Peyto Lake. There are not as many hills around this lake, so when you are visiting it you’ll find yourself parking right along the lake’s shore and you will not have to walk far. There is a parking lot off the driveway up to the Simpson’s Num-Ti-Jah Lodge, right next to Icefields Parkway road. You can walk up to the Simpson’s Num-Ti-Jah Lodge, and stroll along some pretty bridges at the end of the lake. The lake’s shore is also easily accessible. Moraine Lake is one of the most photographed lakes in the area, possibly tied with Lake Louise, due to its unique shade of blue. Moraine Lake is also famous due to the fact that it used to be on the Canadian twenty dollar bill! 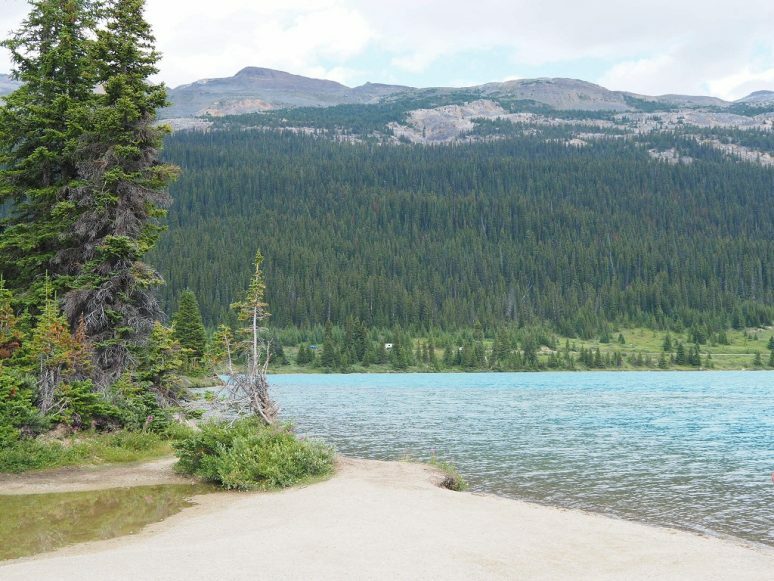 This lake is so blue because of the rock flour found in the lake from the glacier ice. 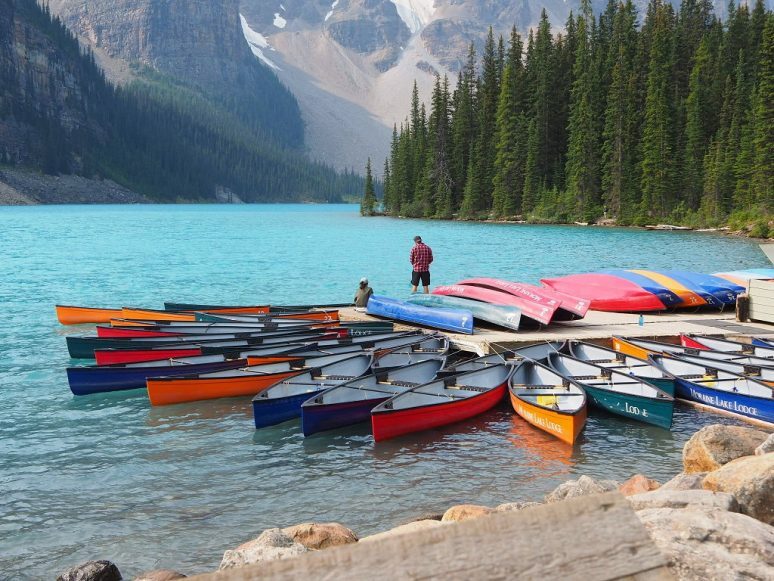 You also have the opportunity to canoe out on Moraine Lake, and it is cheaper than canoeing at Lake Louise. Moraine Lake also has a cafe and gift shop available to pick up a few souvenirs. Parking for Moraine Lake fills up fast – my husband and I drove by at 8:00 am on a Tuesday, and it was already full. Get to the Lake Louise Overflow Parking Lot in the morning, and you will be able to pay $15 to shuttle you to Moraine Lake. The shuttle drops you off right at the lake, and you can complete the short Rockpile Trail for classic photo opportunities. There are also additional hiking paths available. The only way to see Lake Agnes is through a hike from Lake Louise. As someone who is not very athletic, this hike was a bit difficult for me! It’s uphill nearly the entire way – I was honestly surprised at the number of children and older individuals starting the hike. There is a tea house at the top, next to the lake, to complete your journey, but keep in mind that if you visit, the tea house is cash only. You can have the option of sitting at the tea house or taking a snack to go. 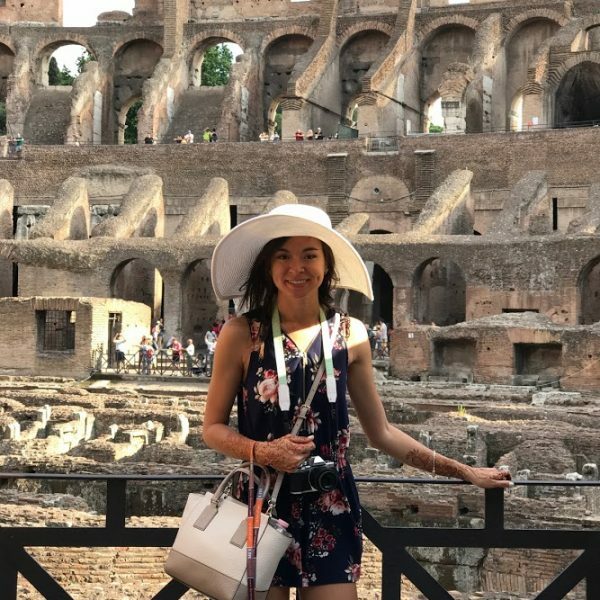 There is a large number of tourists along this popular hike, so if you plan on eating at the tea house, get there as early as possible as there will be quite a line. 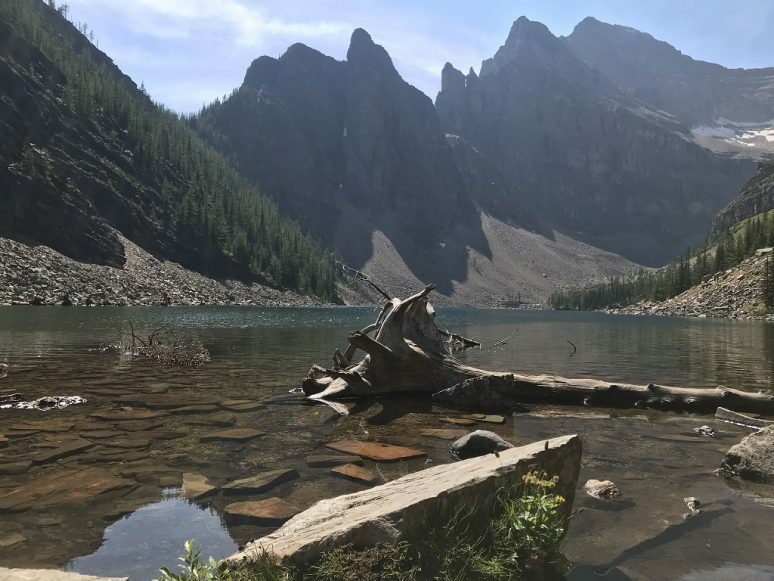 The Lake Agnes hike is a 1.5-hour hike (one way) up from Lake Louise – instructions on how to get to Lake Louise are in the next section below. Get to Lake Louise, go past the Fairmont Chateau on the right, and you will see signs directing you to the hiking path. 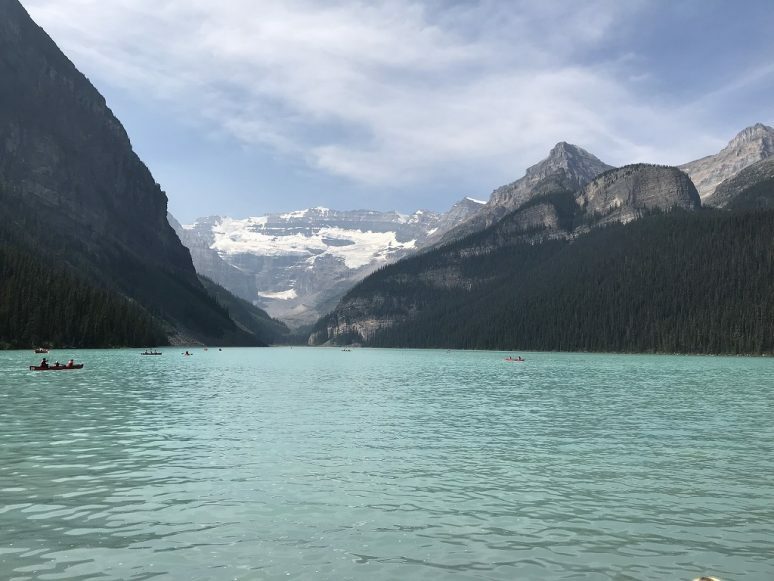 Lake Louise is one of the most popular and most photographed lakes at Banff National Park. If you are looking for that iconic Banff canoe photo, it was likely taken in this location due to the perfect mountain backdrop. This lake is incredibly busy with tourists, so one of the best ways to get away from the crowd is on a canoe ride. Canoe rides run at $110 for an hour, but give you some great photo opportunities and allow you to enjoy the lake without the buzz of the crowds. Lake Louise is also the site of the Fairmont Chateau, which does have a few restaurant and snack options if you need a quick break. At 8:00 am on a Tuesday, the parking lot was already full for us. Either get there incredibly early or head straight to the Lake Louise Overflow Parking Lot in the morning to take the shuttle to Lake Louise. The shuttle is free and included in your park pass. Keep in mind that the shuttle stops running at 5:00 pm, so if you are doing one of the longer hikes, you will want to be sure to get there early. 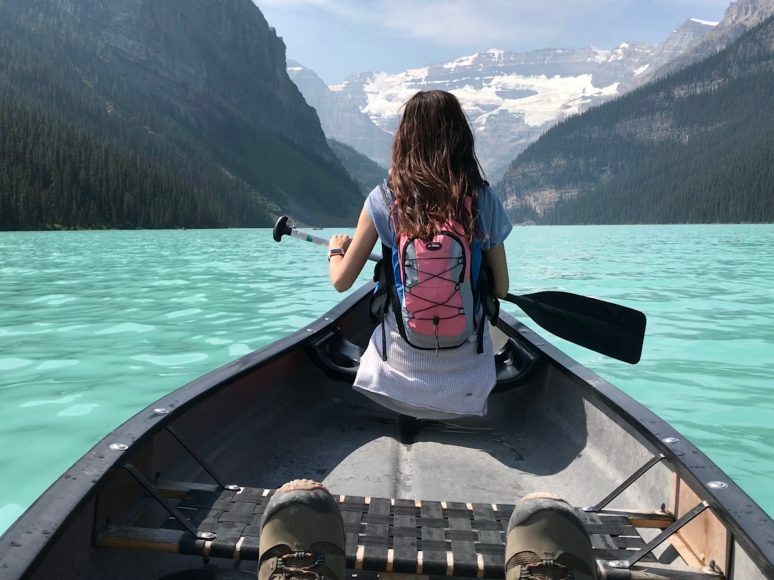 It was recommended to us to visit Lake Louise before Moraine Lake, due to the number of people and how long you will have to wait. Since we knew we would spend more time at Lake Louise, my husband and I foolishly visited Moraine Lake first anyway. By the time we got back to the overflow lot around 11:00 am, the wait to get on the shuttle to Lake Louise was an hour and a half. My husband and I were able to fit in all five of the above lakes over the course of two days, which included a lot of driving and a lot of hiking. Especially when visiting the further away lakes, I would recommend packing some extra snacks in your car. 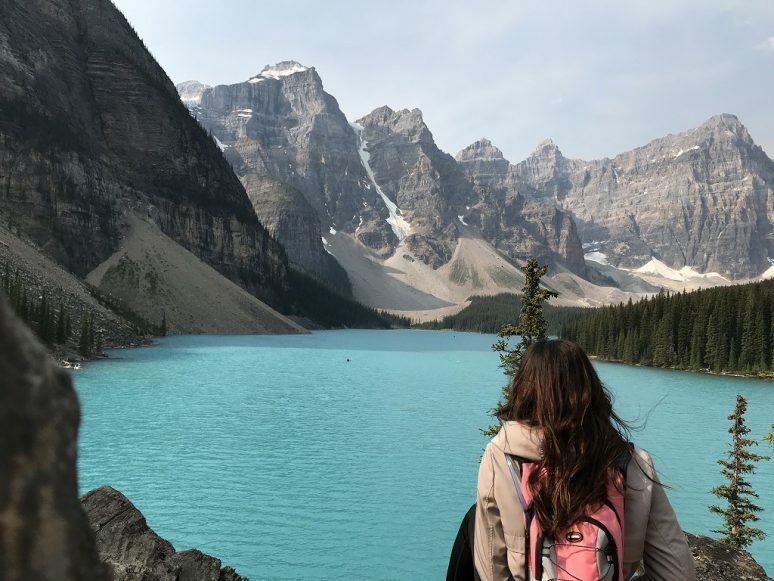 You can’t leave Banff National Park without taking some lake pictures, so make sure to get to your sites as early as possible to avoid the crowds. Though no matter what time of day or year, the view will be absolutely stunning and absolutely worth your trip. Have you ever been to Banff National Park? If you have any additional tips for our readers or questions please leave these in the comments below. Great list. I would definitely add Lake Minnewanka to the list of lakes worth visiting in Banff National Park. We took the lake cruise which was excellent, and because of the position of the lake right in the eastern part of the park, it looked like you were about to sail right out of the mountains as the lake goes to the edge of the hill line! Epic place and worth visiting. ? That sounds so beautiful! 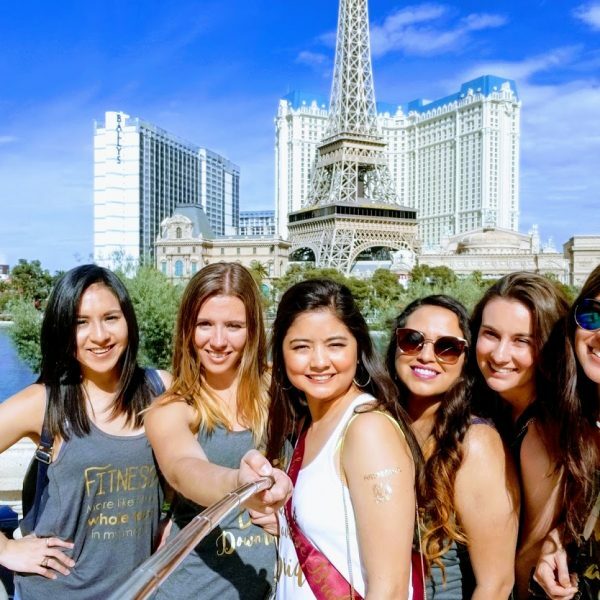 Unfortunately we were only in town for two days, but we definitely would have loved to stay for much longer! Keep in mind too that Lake Louise is frozen from around mid November to mid June. It’s still beautiful in the snow and ice but definitely a different color.